Elvira Fernandez said she called police to teach her son respect after she caught him throwing things at the wall of her south Phoenix trailer. Fearing the 29-year-old would hit her, she went to a neighbor's house to dial 911. When Phoenix police Officer Richard Chrisman and another patrolman arrived in response to her domestic-violence call, she asked them to reason with her son. She expected they would issue a warning and cool things down. Instead, about 15 minutes later, Danny Frank Rodriquez was shot dead inside the trailer. One of the family's dogs was also fatally shot. And Chrisman now faces felony charges. "I felt like I made the wrong choice calling the police," Fernandez, 60, told The Republic on Wednesday from a friend's trailer in the same complex where her son was killed Tuesday. "I regret it with everything in my heart." 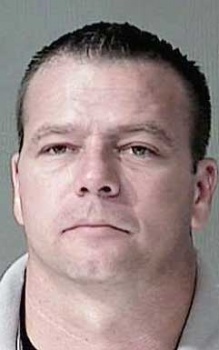 Chrisman, a nine-year veteran who spent his career patrolling the South Mountain Precinct, was arrested hours after the shooting on suspicion of aggravated assault. Police officials said Wednesday that he could face additional charges, possibly murder. The other officer on the scene told police investigators that Rodriquez was unarmed and that neither officer faced any serious threat of violence, according to court documents that describe his interview with police investigators. The south Phoenix shooting came amid ongoing citywide discussion of how police misconduct should be investigated, with a municipal task force scheduled to offer recommendations next month. Michael Johnson, a former Phoenix homicide detective and the only African-American on the City Council, has called for a civilian review board to provide independent oversight of the city's internal-affairs process, after a March incident in which Johnson was detained by an officer. Investigators on Wednesday said additional interviews and evidence could lead Maricopa County prosecutors to file more-severe charges. Phoenix Police Chief Jack Harris and Maricopa County Attorney Rick Romley said they will seek those charges if an autopsy report and additional information reveals that Chrisman abused his authority. "We must be very careful to do this right," Romley said. "If it has occurred, we better not make a mistake, and the officer should be held accountable like anyone else." Harris said he couldn't recall an officer being charged with murder or a similar crime in a police shooting in his career of more than 30 years. National experts on excessive use of force by police said it is rare for an officer to be prosecuted and extremely unusual to see convictions. David Klinger, author of a book on the subject titled "Into the Kill Zone," said there is no nationwide data, but officers who shoot subjects while on duty are prosecuted less than 2 percent of the time, and most of those wind up being acquitted. However, when told that the other officer on the scene described the suspect as unarmed and not a threat, Klinger and others said this case may prove to be an exception to the general rule. "It doesn't look good," noted Klinger, adding that he'd still want to see all the evidence and hear the shooter's statement. Chrisman and Virgillo, patrolling in separate vehicles, both responded to the call at 12:20 p.m. Virgillo said Fernandez asked them to go inside the trailer and talk to her son. When the man refused to let officers in, Virgillo said, Chrisman responded by holding his service weapon to the man's temple and stating that he didn't need a warrant. Virgillo said Chrisman re-holstered his weapon but that a scuffle ensued inside. The officers attempted to subdue Rodriquez with a Taser and with pepper spray. Amid the struggle, Virgillo said, Chrisman shot a dog that was barking inside the trailer. As the struggle continued, Rodriquez tried to leave the trailer on a bicycle and grappled with the officers over the handlebars. As Rodriquez stood near the bike, Virgillo said, Chrisman raised his gun and fired. Paramedics declared Rodriquez dead at the scene. Chrisman, 36, was taken into custody at 7:30 p.m. Tuesday. Harris said Wednesday that he was unclear on why Chrisman ended up firing shots inside the trailer. The chief and other police officers described the dog that was shot dead as a pit bull, though relatives and neighbors said the dog was a several-month-old boxer puppy. Virgillo had told investigators the dog was barking but never threatened the officers. Chrisman made his initial appearance Wednesday. His bond was set at $150,000. The Phoenix Law Enforcement Association, which will represent Chrisman through the internal-affairs investigation, issued a statement of support for the officer, saying the union would help Chrisman's family raise money for bail. Since 2007, Chrisman has faced four internal inquiries handled by the Phoenix Police Professional Standards Bureau - the department's internal-affairs unit. The cases include an excessive-force allegation in 2009, in addition to complaints about personal conduct and inattention to duty, police records show. Police leaders declined to comment on the nature of the complaints or if Chrisman faced any discipline. Police in the city's South Mountain Precinct have come under public scrutiny this year by Councilman Johnson and members of the south Phoenix community in the wake of a March incident in which Johnson accused a patrol officer of violating his civil rights during a predawn handcuffing incident outside his home. Johnson commended Virgillo for "coming forward" and "telling the truth" about the shooting. Other community leaders also praised Virgillo's actions. "He needs to be protected from peer scrutiny and publicly commended for his integrity to the sacred oath he lives by," said Adolfo Maldonado, a south Phoenix community activist who sits on the city's police-review task force. Harris on Wednesday met with nearly 40 south Phoenix community leaders and members of a city-appointed task force designed to come up with recommendations on how the department should better address citizen complaints about police misconduct. He urged them to remind neighbors and residents to remain calm - to judge the case based on facts, rather than rumors. "I wanted to assure them . . . that we will investigate this thoroughly, that we have the facts, and that we take the appropriate action based on the facts," Harris said. Tuesday's south Phoenix slaying is believed to be the first Valley officer-involved shooting in which criminal charges were filed against the officer since a 2002 incident in Chandler. Chandler Officer Dan Lovelace responded to a report of a woman accused of trying to fill a phony prescription at a pharmacy drive-through. When the woman accelerated in her car, Lovelace fired, killing her. Lovelace was charged with second-degree murder, though he was acquitted years later. Phoenix also has seen controversy in the past, including a series of police homicides that prompted public demonstrations. In 1994, a man with no legs named Edward Mallet died in custody when he was placed in a choke hold. Officers were cleared by internal investigations, but the city lost a wrongful-death suit and wound up paying $5.3 million. One year later, a deranged suspect died in a hail of gunfire - hit by 30 rounds from numerous Phoenix officers. Finally, in 1996, a 16-year-old boy was shot 25 times after he brandished a butcher knife. No officer was charged in any of the slayings. Recent cases have kept the issue in the news. Oakland transit Officer Johannes Mehserle, was charged with murder after video evidence showed him shooting Oscar J. Grant III in the back as the suspect lay on the ground. In July, after Mehserle claimed he pulled out his firearm thinking it was a Taser, jurors found him guilty of involuntary manslaughter. Gene O'Donnell, a professor of law and criminal justice at John Jay College of Law and Criminal Justice, said police, prosecutors, jurors, judges and the public are likely to give an officer the benefit of the doubt in use-of-force cases. The alternative, he said, would be to send a dangerous message to law officers: When in danger, hesitate. O'Donnell said the question in any police shooting is whether it was reasonable in context, and the law is extremely forgiving. "There's broad interpretations of what's reasonable, including mistakes and tragedies." Although a shooting may be followed by outbursts from relatives, and even a public outcry, O'Donnell said emotional reactions often yield in the courtroom to the sober understanding of a peace officer's role and dangers. Ultimately, O'Donnell said, jurors must ask themselves, "Do I want to send a cop to prison - make him a felon - for doing the job we sent him to do?" However, he added, a prosecutor might overcome those obstacles with testimony from a fellow officer, and with the image of an officer holding a gun to a suspect's head. Barbara Attard, a consultant who served as independent police auditor for excessive force cases in San Jose, gasped when portions of the initial report were read to her over the phone. "There is a thin blue line, and officers are very reluctant to testify against other officers," Attard said. "I think it's going to be a different kind of case than you usually see." Now that the country is under HS emergency, aren't all law enforcement people under the Federal Government just like the military? Are we attempting to use State courts to convict and sentence someone who should be tried in Federal Court? Odds are he is guilty and odds are he will be aquited. Cops are above the law in the US. When are we going to have some real change?